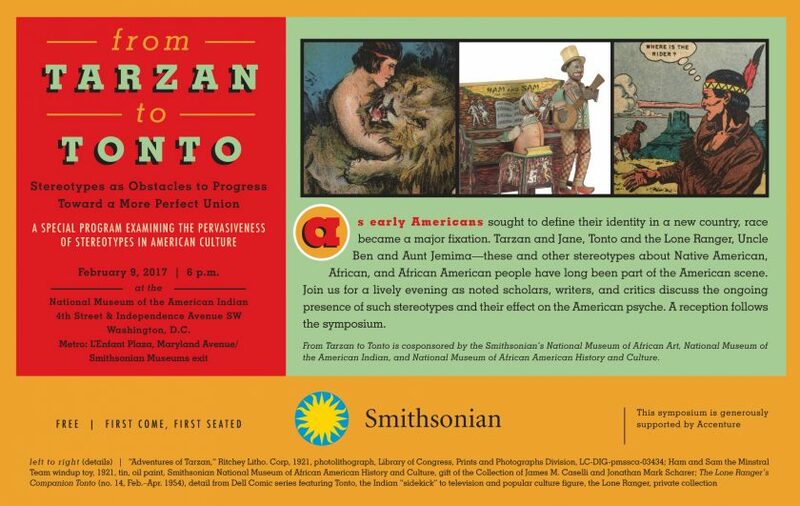 “From Tarzan to Tonto: Stereotypes as Obstacles to Progress Toward a More Perfect Union” explores the role racial stereotypes play in American culture. The symposium is free and open to the public and presented by the National Museum of African Art, National Museum of African American History and Culture and National Museum of the American Indian Thursday, Feb. 9, from 6 p.m. to 8 p.m. in the Rasmuson Theater at the National Museum of the American Indian. The symposium will feature four presenters followed by a panel discussion and a Q&A session. 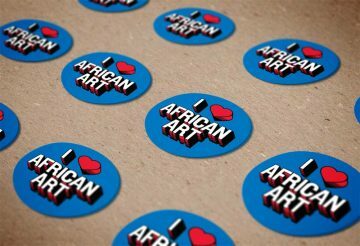 “Tarzan and Jane, Tonto and the Lone Ranger, Uncle Ben and Aunt Jemima—these and other stereotypes about African, Native American and African American people have long been part of the American scene,” said Johnnetta Betsch Cole, director of the National Museum of African Art. “On Feb. 9 noted scholars, writers and film critics will discuss the presence of such stereotypes and the barriers they pose to the advancement of American culture.” The public will join the lively discussion in a Q&A session. Gaurav Desai, professor of English and comparative literature, University of Michigan, will present “Deconstructing Stereotypes in African Literature.” Beginning with asking the questions: What is a stereotype? Is it possible to think beyond stereotypes? Do all stereotypes have the same political valence?, Desai engages these questions drawing upon contemporary African writers. Adrienne Keene (Cherokee Nation), assistant professor, American Studies, Brown University, will present “Navajo Flasks, Hipster Headdresses” and “Magic in North America: Native Representations in Fashion, Media and Popular Culture.” Keene’s talk will focus on the ways Native stereotypes abound in the fashion world and the ways designers are benefitting from the distortion of Native cultures and designs. Keene will also discuss Native stereotypes in other forms of media from coverage of Standing Rock to J.K. Rowling’s Magic in North America. Imani Perry, professor, Center for African American Studies at Princeton University, will present “Racial Narratives and Their Role in Inequality.” Perry will discuss the mechanisms that produces the gap between word and deed in the cultural practice of inequality. Culling through research and analyzing cultural, legal and social realities, Perry also demonstrates that the practices of “racial inequality” are learned broadly through popular narratives. Jesse Wente (Ojibwe), leading film critic and producer for indigenous cinema, will present “First Flicker,” a look at the distorted depiction of Native American Nations and culture in cinema. Beginning with the first motion pictures by engineers/inventors Thomas Edison and William Dickson and early experiments in the silent era when the Western was the most popular genre to the golden age of the Hollywood Western, Wente contrasts on-screen portrayals with the reality of national policy in both the U.S. and Canada towards Indigenous people and the harm this continues to inflict. Professor Tiya Miles of the University of Michigan’s Department of American Culture Department of Afro-American and American Studies will moderate. Speakers include Kevin Gover (Pawnee), director of the National Museum of the American Indian, who will deliver welcoming remarks; Cole, who will deliver opening remarks; and Lonnie Bunch, founding director of the National Museum of African American History and Culture. A reception in the museum’s Potomac Atrium follows the symposium. This program, supported by Accenture, is free and no reservations are required. 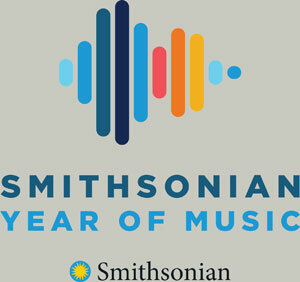 The symposium will also be webcast live at http://nmai.si.edu/explore/multimedia/webcasts/. Webcast viewers are encouraged to participate via Facebook and Twitter by using the hashtag #Stereotypes. The National Museum of the American Indian is committed to advancing knowledge and understanding of the Native cultures of the Western Hemisphere—past, present and future—through partnership with Native people and others. In Washington, the museum is located on the National Mall at Fourth Street and Independence Avenue S.W., accessible from L’Enfant Plaza Metrorail station via the Maryland Avenue/Smithsonian Museums exit. To learn more about the museum’s mission, visit AmericanIndian.si.edu. Follow the museum on Facebook, Twitter and Instagram. The National Museum of African Art is America’s only major museum dedicated to the collection, conservation, study and exhibition of traditional and contemporary African art. The museum is open daily from 10 a.m. to 5:30 p.m. (closed Dec. 25). Admission is free. The museum is located at 950 Independence Ave. S.W., near the Smithsonian Metrorail station on the Blue, Orange and Silver lines. For more information about this program, call (202) 633-4600 or visit the museum’s website at africa.si.edu. Follow the museum on Facebook, Twitter and Instagram. The National Museum of African American History and Culture opened Sept. 24 on the National Mall in Washington, D.C. Occupying a prominent location next to the Washington Monument, the nearly 400,000-square-foot museum is the nation’s largest and most comprehensive cultural destination devoted exclusively to exploring, documenting and showcasing the African American story and its impact on American and world history. For more information about the museum, visit www.nmaahc.si.edu. Follow the museum on Facebook, Twitter and Instagram.